Is Mark Thompson what the NYT really needs right now? One of the most eagerly anticipated CEO announcements in recent media history arrived on Tuesday, with the news that former BBC director-general Mark Thompson has been given the top spot at the New York Times — which has been without a chief executive since former CEO Janet Robinson left in December of last year. As the newspaper grapples with the rapid decline in print advertising that is bleeding the entire industry dry and stakes its financial future on its new digital-subscription model, it needs both a visionary and an intellectual acrobat who can grow new businesses and adapt to shifting market needs while the old model continues to shrink. So is Mark Thompson, a man who has spent his entire career running a government-funded broadcaster, the right person for the job? Obviously the New York Times board — including controlling shareholder Arthur Sulzberger Jr. — believes that he is. But as my colleague Robert Andrews notes in a profile of Thompson, whatever digital vision or expertise in mobile the British public broadcaster has didn’t really come from its director-general, and he was seen by many primarily as a “custodian and curator.” As the New York Times tries to adapt to a fundamental shift in the way media works, is that really the kind of leader it needs? The challenges that the New York Times is facing are well-known, and they are a microcosm of the unprecedented pressures that the entire newspaper industry — if not the entire traditional media industry — is struggling with. Print-advertising revenue, which has been the driving force behind the newspaper business for half a century, has been in virtual free fall for the past several years, and if anything the decline is picking up speed. 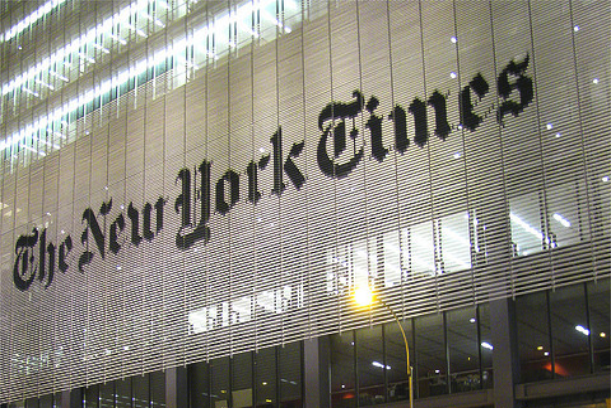 Being a well-known and global brand like the NYT no doubt helps, but it is not enough: In its most recent financial statement, the paper said print-ad revenue at the company dropped by 7 percent. Even more disturbing than that, the paper’s online ad revenue — which theoretically should be one of the bright spots amid the gloom — declined as well. Advertisers are increasingly looking for targeted ad programs that reach specific groups, and the reality is that social networks such as Facebook and Twitter and web-native publishers are seen as better places to achieve that. On the bright side, the NYT‘s paywall program is generating substantial amounts of revenue. Exactly how much isn’t clear, because the paper doesn’t break out things like discounts and giveaways. What we know is that there are more than 500,000 subscribers who pay for the paper’s digital product in one form or another, and it is estimated to be making about $100 million. As we noted recently, this has pushed the NYT over the threshold to where it is now pulling in more revenue from subscriptions than it does from advertising, a historic shift the Financial Times is also close to achieving. Even though the paywall is being hailed as a success, however — and has inspired hundreds of other newspapers throughout the United States to implement their own versions of the subscription model — the revenue it is generating is still not enough to make up for the decline in the paper’s print advertising. In other words, the paywall is bringing in new blood, but the exsanguination of the New York Times continues through other orifices. For at least a few years, About.com (which the paper acquired in 2005 for $410 million) helped make up for that flow, but it has been hammered by Google and the NYT is now looking to unload it. Is Mark Thompson going to reinvent the Times? So what does Mark Thompson bring to this picture? Obviously he is used to running a giant media entity with global aspirations, and from the sounds of it the New York Times is interested in his expertise in the field of video — one of the areas where the paper is hoping it can develop new offerings and hopefully bring in new forms of revenue (the Wall Street Journal has been making similar moves). But at the same time, a government-funded entity with a guaranteed revenue stream is a very different animal from a publicly traded newspaper whose core business is being eroded at an almost unprecedented rate. Observers have made jokes about how answering to the Sulzberger family will be very similar to answering to the British government, and some have noted that being funded by public contributions is at least a little like being financed by reader subscriptions. But there’s a crucial difference between the BBC and the New York Times: In Britain, television viewers are required by law to pay a license that helps fund the broadcaster. The newspaper has no way of forcing anyone to do anything, and its digital product exists in an increasingly crowded marketplace. I have written before about some of the things a new CEO could do in order to help the New York Times become a success in this new digital environment, including a focus on new forms of engagement with readers such as live events and other forms of “membership benefits” (in effect, a kind of reverse-paywall approach) instead of pinning all its hopes on a paywall. Could the NYT acquire something like Flipboard as a way of jump-starting its transition from being an information gatekeeper to being a digital curation machine? Possibly. But Mark Thompson doesn’t seem like the kind of CEO who would make that sort of bet. The bottom line is that a business-as-usual or custodial approach is not going to cut it at the NYT, not when revenues are declining as rapidly as they have been. And shedding some staff or tweaking the product with a few digital bells and whistles isn’t likely to accomplish much either. The legendary paper doesn’t need someone to manage its business; it needs someone to reinvent it on a fairly fundamental level. Whether Mark Thompson is the man for that particular job remains to be seen. I have to believe the guy in charge of an era which has transformed the BBC into a digital media company via iplayer and several other internal projects. Might be able to drag a us print publication out of the mire. Dealing with a state funded, not government funded. People pay for the bbc is always going to be harder than a commercial company as your are always going to reach a point where there is no more cash..
Nice comment about the Sulzbergers may want a guy who functions more as a COO than as a CEO. The Times (and other media companies) have an opportunity to re-invent advertising around segments of users – to create lifestyle segments around data coming from the combination of user demographics and data from the way people consume news. Essentially an enhancement to collaborative filtering techniques, but with many more data points to go on, and a focus on aspirational consumption, not just observed consumption patterns in each individual or sub-group.